Last week, reports in Italy claimed that Liverpool are open to selling £20m flop Lazar Markovic, but after only one season at Anfield, it seems unlikely. 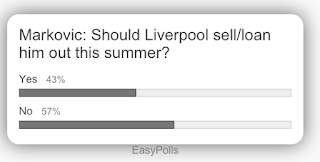 Stranger things have happened, though, so what do Reds fans think about the prospect of losing Markovic this summer? * Inter Milan want to in sign Markovic, and are interested in a loan-to-buy agreement. * Rodgers is allegedly 'not impressed' with Markovic, and wants to sell. 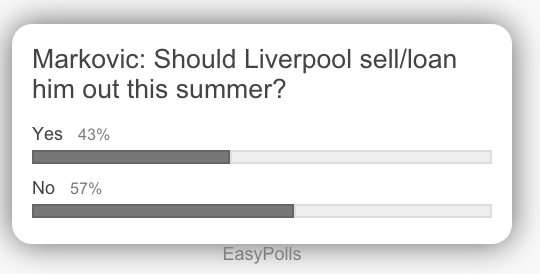 * 57% of participants voted NO to letting Markovic leave. This is a bit of a surprise result, especially given Markovic's inability to make any consistent impact this season, but to be fair, there's probably a recognition amongst fans that he is not entirely to blame for his failure to score/assist regularly this season. Brendan Rodgers is currently feeling the fire for Liverpool's abject capitulation last season, and that's taken a lot of heat of the players, who deserve (IMO) just as much criticism for the Reds' failure to finish in the Premier League's top four. In Markovic's case, his confidence has clearly been dented by Rodgers' pigheaded insistence on playing him out of position as a wing-back. The only thing he has going for him in that role is pace, and that's not enough to be an effective wing-back. In many ways, Markovic - like Javi Manquillo - is a victim of Rodgers' mid-season switch to 343, but the 20-year old is an attacking player, and he should be played in an attacking role high up the pitch, or not at all. If Rodgers is unwilling to play him in that role next season, then parting ways is the best thing for both Liverpool and Markovic. If Markovic stays, though, he'll have to deliver this season. The 'settling-in' excuse will no longer wash, and fans will expect a hell of a lot more than 3 goals in 34 games.